Doctor Who: The Man Who Designed The TARDIS | Warped Factor - Words in the Key of Geek. Christopher Morley steps inside the very first TARDIS, and salutes the man who designed it! Peter Brachacki was born Kazimierz Piotr Brachacki in Poland in 1926, & amazingly wasn't actually all that enthusiastic about working on Doctor Who! Which might explain why his handiwork graces only An Unearthly Child, though his ideas inform much of the eventual design of the inside of the ship. The sterile, white timeless look. The scattering about of random furniture and objects from different periods- the chair, hat stand etc. There's also a computer bank which contains various subsystems of the ship- the fault locator being just one example. The central hexagonal console, designed so that all controls should be equally accessible to a single pilot. The moving time column, intended to give an at-a-glance indication of the ship's status and whereabouts. The roundels set into the wall, intended to pulsate when the ship was in motion. 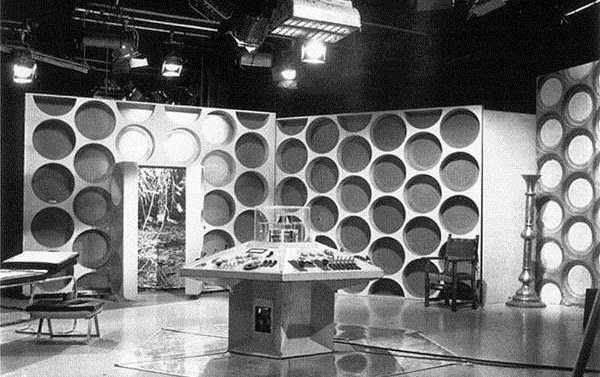 ( though director Waris Hussein claims they came about as a result of a round pattern in the plastic Brachacki used to make the TARDIS walls. "At a glance it is a reasonably faithful reproduction of those Police Boxes which could be seen on the streets of England in the sixties, but there are differences. Its roof stacks were not tall enough, and nor was its top 'pyramid' which resulted in the whole prop being a lot shorter than a real box." Of course, we get to see it in all its glory in The Edge Of Destruction, the first story in which the TARDIS becomes so much more than a handy ride for the Doctor & his companions! It becomes the star, serving as both setting & a key element of the narrative in that it seeks to warn its passengers that something's wrong- the Fast Return Switch is stuck, following a quick escape in The Daleks. This appears to be the Doctor's first glimpse of the implied sentient nature of the TARDIS- which isn't strictly his, a plausible explanation for his difficulties in piloting it & giving some credence to Ian's ridiculing of him & the 'old girl'.